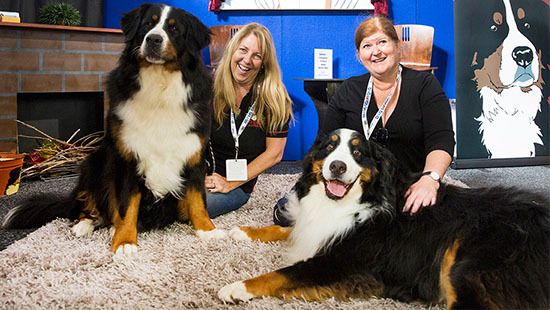 The Breed Showcase was one of the most popular features at the Dog Lovers Show! Visitors got up close and paw-sonal with over 100 breeds at the 2018 Brisbane show including over 40 Dogs Queensland Breed Clubs. Visitors enjoyed the Ask-A-Breeder Stage Talks where they can heard presentations directly from Breed Clubs on a wide range of Dogs. Our Breed Showcase is always a great opportunity to gather valuable information and learn more about the most suitable Dog breed for your lifestyle. Visitors could also find some of the Breed Showcase Dogs being featured in our Pat-A-Pooch zone, which was a great opportunity to meet, pat and get to know a variety of wonderful breeds on a more personal level (while resting on comfy beanbags!). The Perfect Match feature sponsored by Bow Wow Meow helped visitors discover some of the most ideal breeds to suit their lifestyle with a detailed questionnaire and 50+ large information posters on display. Expert representatives from Dogs Queensland were on hand to ensure visitors were equipped with trusted and reliable information needed when selecting a new Dog or puppy. Check out the full list of Breed Clubs who attended Brisbane event’s Breed Showcase here.